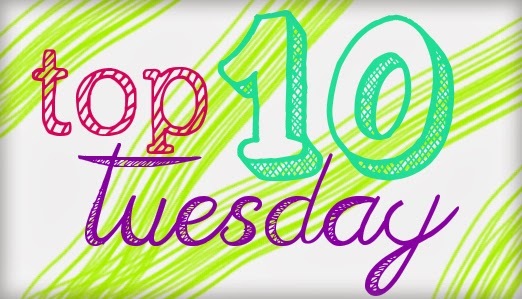 This week's Top Ten Tuesday prompt is Top 10 Characters Who __________, and since it's FTF, I of course related this back to fairy tales. So today, I'll be telling you about the Top 10 characters whose worlds I'd like to visit. This may sound a bit easy (I mean, why would I not want to visit a fairy tale world? ), but when you consider the sheer amount of curses and men kissing corpses, most of these realms make me a little leery. Surprisingly, not so easy to come up with 10. Which led me to a slight revision — let's make it Top 5 I want to visit, and Top 5 I don't. East o' the Sun, West o' the Moon. I love this story. I'd love to explore the isolated, enchanted castle. I love the frozen, icy, barren landscape. I love that sometimes there are trolls. But mostly, I really want to meet the Bear. Okay, maybe this is cheating, since BatB is a very similar tale to East/West. And I swear I'm not a furry with some beastly/bearish-thing fetish. Really. But the same things I love about East, I love about Beauty. I like the isolation, the exploration, the mystery and intrigue, and the decided lack of homicidal maniacs wanting to tear a girl to pieces because she's pretty. For the lulz, friends. For the lulz. This was my favorite tale growing up (along with The Elves and the Shoemaker), and I wanted desperately to visit that underground world of wonder, where the princesses danced every night. I still want to. REALLY, REALLY, A LOT. Hans Christian Andersen's tales are often long and convoluted, and immensely depressing, and I can certainly do without the heavy-handed religious overtones. In fact, overtones is not even a strong enough word, 'cause Andersen beats you over the head with it in The Snow Queen. BUT, that doesn't stop it from being one of the most fascinating, most fully-realized worlds of any fairy tale that comes to mind. Though it may be fun to visit the gingerbread cottage for awhile, this is a world where a mother and father intentionally lose their kids deep in the forest and abandon them to starve because that's the easiest option, AND THEN when the kids successfully murder an old woman (who, admittedly, wanted to murder them first), the kids are praised, the old lady's house is raided, and the family is reunited and happy. Because I know I'd want to move back in with Ma and Pa like everything was cool after they abandoned me in the woods near a wicked witches house. Duuuuuuuuuude. Forget that mad fairy, 100-year curse mess. In most versions, SB pricks herself on a "spindle" after being kept far away from them all her life (subtle imagery there, folks), and then she wakes up years later, inexplicably having just given birth. TO TWINS. And depending on the version you're reading, the story just gets worse from there: once she wakes up and is forced to marry the prince who apparently knocked her up mid-coma, she has to constantly dodge the maniacal machinations of her new mother in law, who intends to cook up her kids in a nice, hearty stew... Not bad enough? Some stories make her new baby daddy an already-married King; thus, the Queen has a reason (still totally insane) for wanting to cook the kids — she wants to serve them for dinner to her philandering husband. Yum, vengeance soup! So yeah. Do not want to visit the world of Everybody's Crazystan. Homie has a room full of dead wives. Hard pass. It's a tower. The grand tour of Rapunzel's world would take about 14 seconds, and then I'd just be sitting around, worrying about how often she sheds, 'cause nobody wants to be covered in that. I mean, on the one hand — fairy godmothers. On the other — the most disturbingly beauty/man-hunting/manipulative world of just about any story. Yes, even more than Snow White, because even though Snow White's stepmother is so jealous of other's beauty that she wants to cut out and eat the heart of her 7 year old daughter, the case can be made that she's just seriously whacked. But in Cinderella, nearly every woman in the story is Snow White's Mom-levels of crazy. They literally mutilate themselves to become the ideal to marry the prince (who, mind, can't seem to remember what his true love looks like. Like, at all. Couldn't pick her out of a lineup. Couldn't even pick the right lineup to pick her out of — he's got nothing to go on but a shoe, which will apparently only fit one woman, 'cause that makes sense...). It's whole new levels of crazy up in this story, and I Do. Not. Want. Some what are some of the fairy tale places you MOST and LEAST want to visit? Oh, I like the way you did it! I struggled to hit ten myself today! I almost did five...I should have done five and five like you! You've got some great PROs and CONs. I think East O'the Sun and Beauty would be my favorite...and, if it turned out like the Disney version and not the REAL version, The Little Mermaid, because MERMAIDS!!!! The thing I always hated about Bluebeard is that it is trying to say "hey ladies listen to your man when he tells you not to do somerhing". Excuse me but I would rather find out my man is a homicidal tyrant Asap rather than blindly obey and oops what if I "accidentaly" run chest first into his sword someday. Nail on the head, right there. I think I'd go to Mother Hulda's, too, because the tale involves the same Puritan work ethic I was raised with, so I'd be stinking flat-out rich. I'd steer clear of any worlds where people can spy on you through a mirror, and where beauty is so highly prized that it marks you for death. Talk about paranoia!